Like any people without disabilities, young people with disabilities also experience the natural sexual development and the sexual excitement as well as sexual curiosity (Murphy, 2005; Rutgers WPF, 2006). Nevertheless, partly due to the stereotype of people with disabilities as asexual (Addlakha, 2007; Ansell, 2005; Murphy, 2005; Shakespeare et al., 1996), society unlikely views young people with disabilities as sexual beings. There is a limited research done on this topic, partly due to the fact that sexuality is not considered as important as social inclusion, professional enhancement, capacity building and rehabilitation. This research explores the unheard stories of young people with disabilities by investigating their views and experiences as sexual beings. It employs qualitative interviewing and ethnographic approaches using concepts of youth, disability and sexuality as analytical lenses, placing emphasis on gender role as crucial in determining different sexual experiences. Acknowledging that young people with disabilities are not a homogenous group, neither in terms of sexuality, the research brings up the opinions and experiences of boys and girls with disabilities. In doing so, it shows the primary difference in sexual expression between males and females, as well as their perception of ‘being sexual’. Such perception, for the young men, is linked to sexual conducts and for the women, is linked to the notion of marriage. 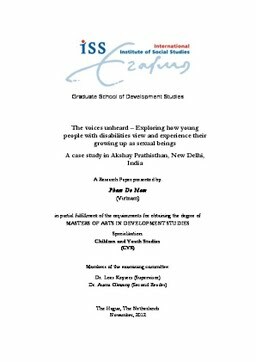 Moreover, it explains how young people with disabilities cope with social structure including norms and values as they experience the progress of growing up as sexual beings, and indicates their vulnerability as passive patients whose rights are ignored. By letting young people with disabilities speak for themselves, the research presents some well-hidden details of individuals’ intimacy of those who are young, disabled and yet sexual. It concludes that young people with disabilities should not be treated as patients, but rather as right holders whose sexuality needs to be acknowledged and respected so that they are able to enjoy safe, active and healthy sexual life as any young people without disabilities.